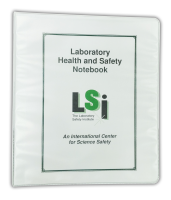 This is the workbook that accompanies our most popular course, the 2-day lab safety short course. It provides an overview of lab safety, with all the slides and handouts from the class. Quantity discounts available – ask info@labsafety.org.